The report card release was covered by the NY Post , DNAinfo and Chalkbeat. 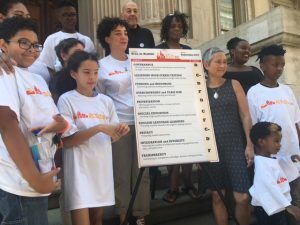 Today at 11:30 AM on the steps of Tweed, the headquarters of the NYC Department of Education, NYC Kids PAC released their 2017 Education Report card for Mayor de Blasio. The Kids PAC board is composed of parent leaders and education advocates; they were joined at the event by other parents, teachers and students. Governance, Testing, Funding, Overcrowding and Class Size, Privatization, Special Education, English Language Learners, Privacy, Diversity and Transparency. For context, here are the NYC Kids PAC 2015 and 2016 report cards for the Mayor.